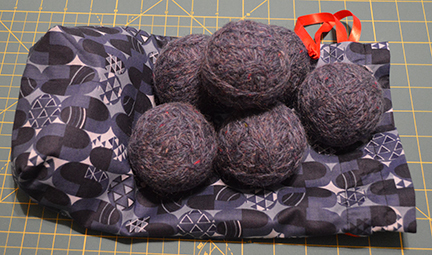 If you’re looking for a last-minute DIY gift ideas, look no further than these wool dryer balls, complete with their own carrying case. These are totally doable before the big day next week and don’t take much fabric. A fat quarter and some scraps will do it. If you’d like to learn more about how useful the balls are, you can check out my first post about them here. You can find the tutorial I used at The Seasoned Homemaker. I’ve used my set for about a year now and am ready to make another one (their fabric-softening properties only last that long). The one you see above is for one of my hippie-granola friends who I hope will appreciate something he can use without any excess chemicals. If nothing else, I hope he gets a laugh. 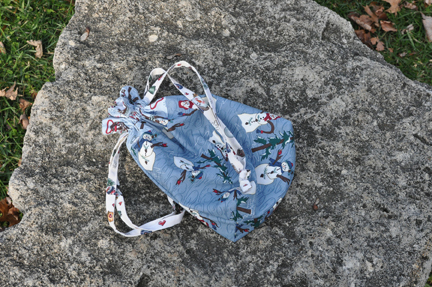 For the carrying bag, I used my favorite drawstring bag tutorial from Jeni Baker at In Color Order found here. 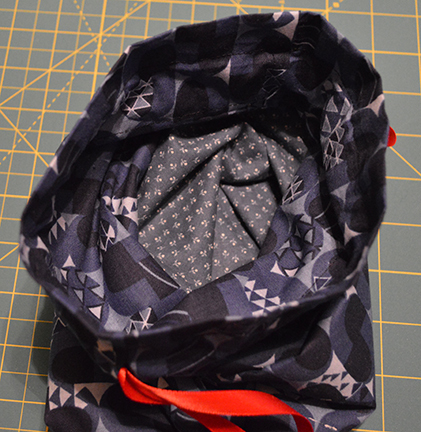 Because I only had one fat quarter to work with, I made the bag a little narrower and taller, and added some scrap fabric inside to complete the lining. 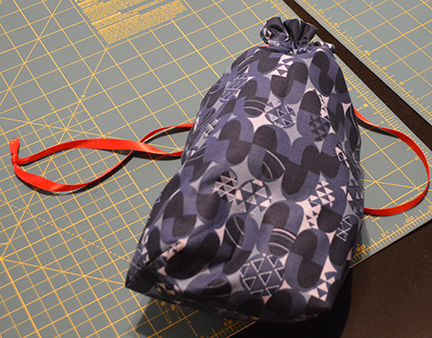 This time I used ribbon for the drawstrings and it was really nice to have one less sewing step. I also made a cover for the Nook Color my friend’s daughter uses. I’m not 100 percent happy with how it turned out — next time I think I’ll make it a little wider. In fact, I’m a little worried it’s too small, but if I’m lucky it’ll just be a snug fit. I used a combination of posts: the Nook Cover from Sara at Sew Sweetness found here and the iPad cover from One Shabby Chick found here, plus my own idea for a closure. 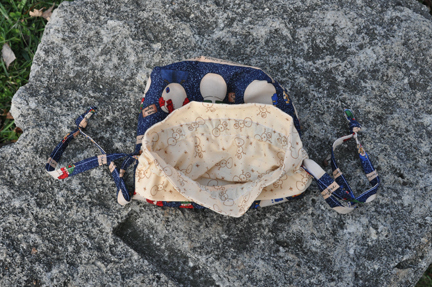 If I were to make one again, in addition to making it wider, I think I’d skip the interfacing and just quilt it. I don’t think it really needs the extra stiffness. 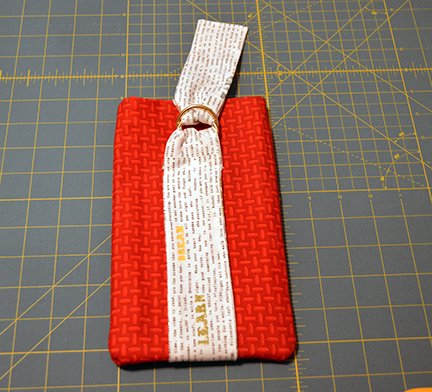 At least I’m happy with the fabric choice — red is her favorite color and a text print is the perfect accent. Now I have just one more gift to make, and then I’m home free for this year — wish me luck! The rain has washed away all the pretty snow from last week, and all we’re left with around here is wet and gray. I can’t complain, though. Today is the start of two-plus weeks away from my day job, and this year, it’s an especially needed break. 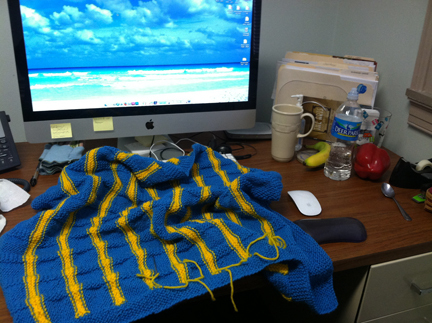 Earlier this week I discovered simple, small knit projects were a great thing to do in my office during lunch. Not only did I finish the baby blanket I made this fall, finishing something felt fantastic and rekindled my interest in knitting. One of my goals for the new year (actually, it’s the same resolution every year) is to finish more projects before starting new ones. Here’s a look at what I’ll be working on next during my lunch hours when I get back to work. That is, if I don’t finish it over the holiday. 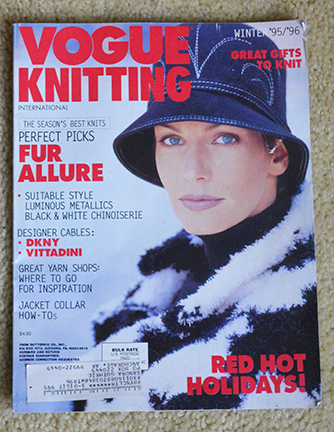 This is from Vogue Knitting, Winter ’95-’96, back in the day when intarsia knitting was all the rage. 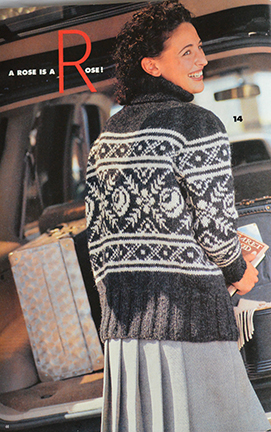 While it is an older pattern, I think the look and styling of the sweater is pretty classic. I love two-color (one color being white) graphic patterns, and I really liked the combo deal of something geometric with the diamond motif together with the rose and leaf trellis. 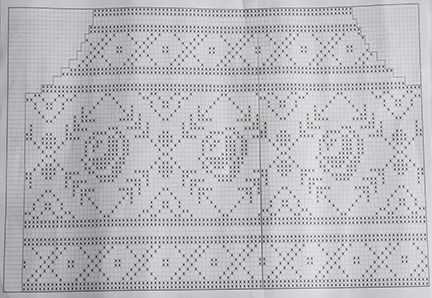 With most repetitive patterns, a magazine usually prints just enough to show you the repeat, so what I like to do is plot it into Excel and get a full size pattern. This is so much easier to follow than a little 10-square grid. I made it the same way I do when I design quilts with Excel. You can see that post here. Instead of the gray, I happened to have enough of a pretty, tweedy blue in my stash, so all I had to buy was the white. I’m using Garavogue Tweed, 100 percent wool, color 1586 for the blue. The white is Lamb’s Pride. 85 percent wool, 15 percent mohair, color M-11 White Frost. 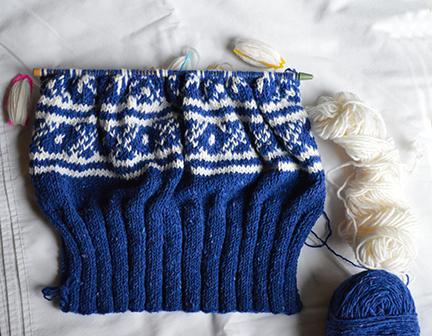 I usually start with the sleeves — it gives me that sense of accomplishment early on. 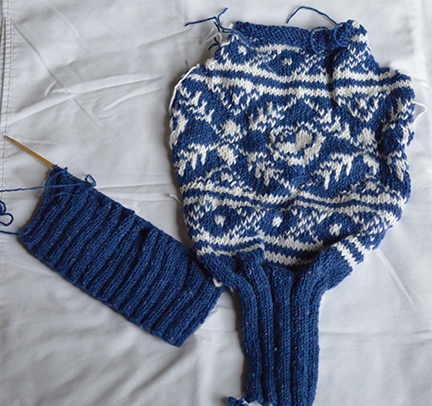 Once I have the ribbing done and have cast on to larger needles, I almost always take the smaller needles and cast on the next sleeve so I can work on the ribbing while I’m working my way up the pattern. It seems to make it easier for me that way and I can measure the ribbings together and make sure they’re the same length if I’m not counting rows. Here is one of the sleeves and the bottom of the front. I have made the second sleeve, I just forgot to put it in the photo. It’s been awhile since I’ve worked on this and I thought I was further along on the back, but I vaguely recall doing a major frog on this piece because I found a mistake. The same mistake — placing one of the motifs a row higher than it should be — is also on the sleeves, but I think I’ll just live with it on them since I don’t think it will be as noticeable. Well, and because I really don’t want to rip them out and redo them. As much as I like the gray/white in the magazine, I think the blue works equally well. 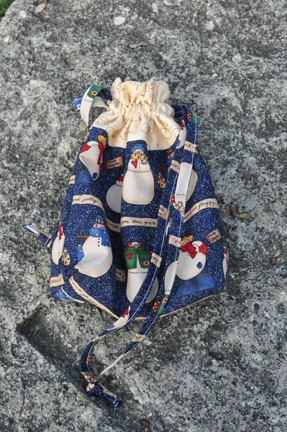 Before I can get to it, though, I still have a few last-minute Christmas gifts to make. … especially with a view of my happy place on a big screen computer! p.s. No, Lola didn’t take this photo – she’s resting comfortably at home. Can’t wait to be with her. I am so excited to share with you an early Christmas present Santa Claus brought me today. I think I’m going to love having her around. Are you excited to see her? This is the last cell phone photo you’ll likely ever see here now that Lola’s around. Lola is my beautiful new camera. 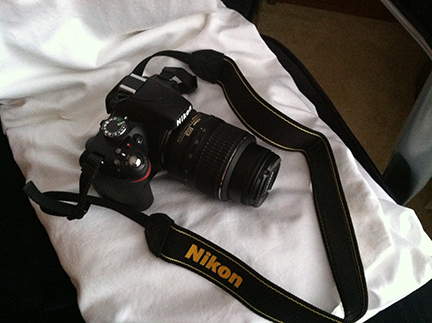 A Nikon D3200, which is a great starter DSLR. After a year of research where I read many excellent online reviews as well as a strong recommendation from a pro photographer I work with, I decided she was the best choice to start me on one of my goals for the new year — better blog photos. 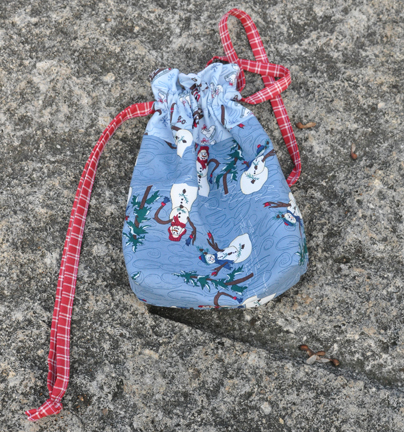 Best of all, Santa also brought me some new fabric in the mail today, but you’ll have to wait till the weather improves before I can show it to you. Rule #1 of good photography is natural light! Now that Thanksgiving has passed, we are full on into the holiday season. For me, that meant instead of dealing with the massive Black Friday crowds, I put up some Christmas decorations and got a start on my holiday sewing. 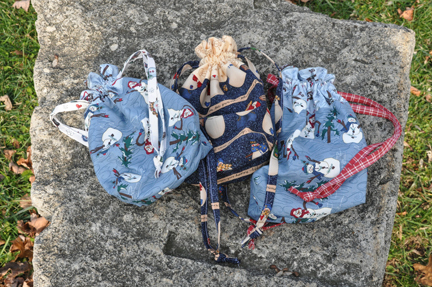 In addition to the blankets I’ve made for gifts from my tutorial here, I focused on making these cute gift bags from a tutorial by Jeni at In Color Order. These were incredibly easy to make, especially with Jeni’s terrific instructions, even with making the strings rather than buying ribbon. Much like the blankets, I loved coming up with the fabric combinations. Best of all, the fabrics were from gifts from quilting friends, along with some stuff that’s been in my stash for more than a decade. Great to clean it out and put it to good use. Here are all three, ready for stuffing with homemade goodies. They’ll be a perfect gift for neighbors and other friends. I’m sure I’ll make a few more before the season is over!